An investigation into the limiting oxygen concentration (LOC) of fifteen combustible dusts, one gas, two solvents and their mixtures in the standard 20-liter explosion chamber was performed. Three ignition energies (10 J, 2 kJ and 10 kJ) were used. The results show that a 10âJ spark leads to significantly higher limiting oxygen concentration values than either 2-kJ or 10-kJ pyrotechnic igniters. This could be due to the âoverdrivingâ effect of the chemical igniters, which produce a hot flame that virtually covers the entire explosion chamber during combustion. Moreover, with respect to hybrid mixture investigation, the 20-liter sphere was modified to allow the input of gases, vapors and sprays. 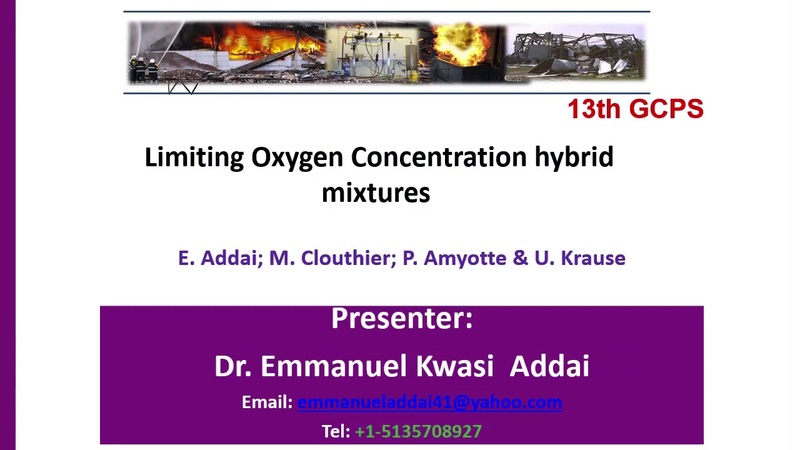 The limiting oxygen concentrations of the hybrid mixtures were found to be considerably lower than those of dust-air mixtures, when the relatively weaker spark igniter was used. There was no significant change in limiting oxygen concentration when the higher-energy chemical igniters were used. Mathematical models to estimate the limiting oxygen concentration of dusts, gases and hybrid mixtures are presented. The model predictions show good agreement with experimental results. Based on model calculations for the limiting oxygen concentration of dusts and hybrid mixtures, a diagram is presented which allows the estimation of the limiting oxygen concentration from properties which are relatively easy to determine (i.e., elemental analysis of the dust and the calorific value). This research provides safety practitioners with a practicable means to characterize material hazards without the need to perform a large number of tests.